We are told donating unwanted goods to the local op shop helps others and is good for the environment. I have found it to be a great help when decluttering. I pop items I no longer want into a bag or box and deliver them to an op shop knowing the money raised from their sale will help those in need. Through discussion with volunteers at local op shops I have picked up a few tips. Some op shops sell furniture but many do not have the space. Check what items can be accepted. Second hand mattresses are usually not sold at op shops. Ask if the item can be picked up or if you will need to deliver it and the best time to do so. There may be limited hours when larger items can be dropped off depending on when able bodied volunteers are available. A few op shops accept electrical items which they will test for safety before selling. However, many do not take electrical items. Ask before donating electrical goods. Some op shops are grateful for donations of plastic or other supermarket bags to give their customers. I asked if my nearest op shop would like some bubble wrap for wrapping fragile items and they were very happy to take it. If you have just moved house or do a lot of online shopping for items that need protective wrapping you may have surplus bubble wrap. 3. Can items be left in a charity bin or do they need to be handed to staff? 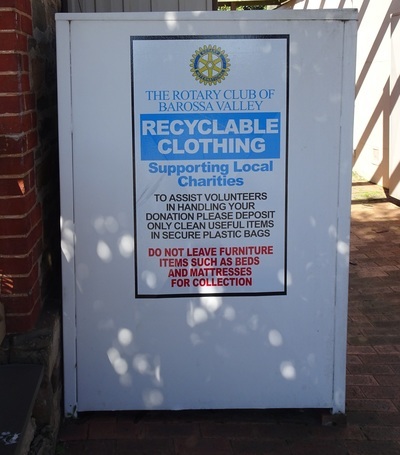 Many op shops have large charity bins where you can drop off items at most times. I did note one organisation had their bins roped off over the Christmas/New Year break last year meaning I was unable to leave my donations. I guess they feared the bins being filled to overflowing during the three week period their shop was closed. Be aware your item needs to be small enough to fit through the flap. It is an offence with a hefty fine to leave donations outside the bins if they won't fit or the bin is full. Some op shops don't have a bin and you will need to deliver your donations to staff during shop hours. Breakable items need to be delivered. Before donating an item make sure it is clean and in good condition. Would you give it to a friend or would you be embarrassed because it's grubby or has seen better days? This applies whether we are talking about clothing, books, toys, household items or furniture. Now, some shops may take towels, blankets and the like suitable for bedding for dogs. This is especially the case with those op shops that are run by charities such as the Animal Welfare League that support animals in need of a new home. Op shops may also bag ripped cotton items and sell them as rags. Enquire before you leave donations which are only suitable for rags and ask if rag material should be donated separately from items in good condition and the bag labelled to save volunteers time sorting. Make sure clothing is laundered and has nothing in the pockets. Tie the laces of shoes together or attach the two shoes in some other way. Put gloves and socks in pairs, tucked into each other. Empty handbags and check all the zipped pockets for tissues, money or small pieces of jewellery you don't want to donate. Put each pair of earrings in a tiny zip lock bag or attach to a piece of cardboard so they stay together as a pair and don't get lost among the larger items you are donating. Volunteers will appreciate the care you take when donating your unwanted goods. If something is rubbish, don't 'donate' it. Op shops spend large amounts of money every year disposing of unsaleable items that have been left in charity bins or around their shops. Do you often see abandoned supermarket trolleys near your home?